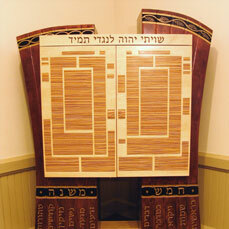 David Strauss has been producing functional art for synagogues, Hillel foundations, and day schools throughout the country for over 20 years. Drawing lovingly on Jewish tradition, David brings a spiritual dimension to his contemporary sculpted arks, furnishings and room designs. 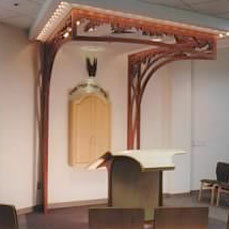 His major installations in carved woods, metal, stained glass and fabric often combine themes from nature with Biblical or liturgical texts to transform spaces into welcoming environments for Jewish worship. David specializes in working with architects and building committees. His goal is to design and create inspirational synagogue art and furnishings that express the values of the congregation and complement the synagogue’s existing design. 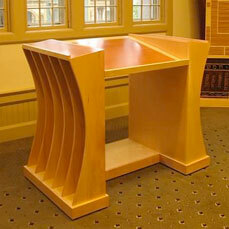 David will work with your particular design needs and your budget to create customized works of art. Please contact him for further information. © Copyright 2019, David Strauss Designs. All Rights Reserved.